Include Edibles Among The Flowers: Certain herbs and veggies provide great foliage in ornamental pots. Pop in some kale, lemongrass or rosemary to frame your pretty flower picks. Eat The Flowers, Too: Plant edible blooms like violets and nasturtiums, which look lovely as a garnish in salads or to add some pizzazz to an ice cube. Cage Your Tomatoes: Place tomato cages around your plants when they are still small so the plant can grow into them. Doing this later could damage the plant. Give Herbs A Haircut: Herbs are ideal plants to have handy as they offer an easy and healthy way to add flavour to any dish. Trim your herbs regularly to prevent flowers from appearing. Once an herb like basil blooms, the leaves become bitter and are no longer edible. 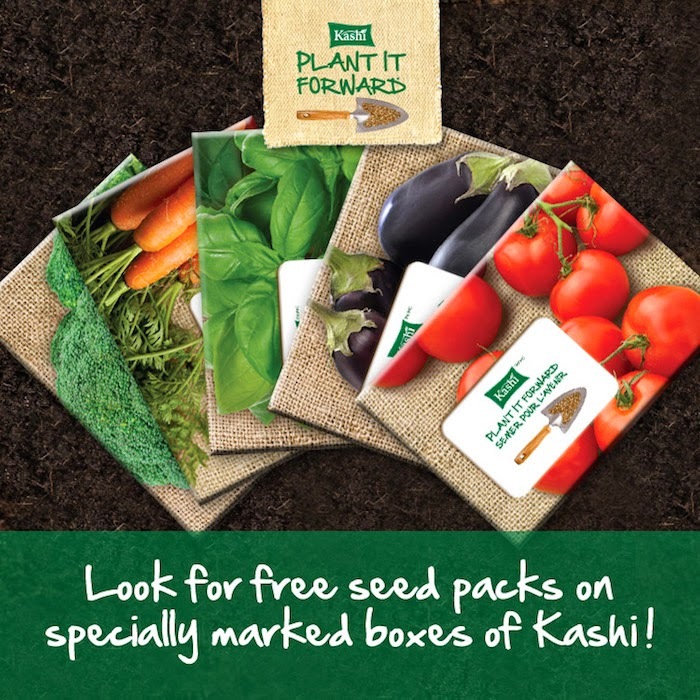 Grow Up: If you have a small growing area, maximize space by choosing vining crops such as peas, squash or cucumbers. Use trellises or stakes to train the plants to grow upwards. Hang It Up: Another way to maximize growing space is to plant certain fruits and veggies in hanging pots. Strawberries, for example, do well in hanging baskets. And keep an eye out for upside down tomato planters. Keep It Contained: Be wary of voracious spreaders like mint and chamomile, which can take over your garden. Keep these types of plants in pots and out of the garden. Sow A Rainbow: Consider including interesting heirloom veggies in your garden, like purple carrots, yellow beets and peach tomatoes. You’ll be amazed by the fresh flavours. Plant Your Grocery List: While it’s fun to grow a variety of fruits and veggies, think about what your family likes to eat the most. If you make a lot of pasta sauce or salsa, for example, grow lots of tomatoes and herbs. Grow Salad Bowl: Lettuce is a great cool-season crop that you can plant now. Fill a bowl (be sure there are holes in the bottom) or old colander with soil and sprinkle with lettuce seeds. Lightly rake the soil to cover and water regularly. 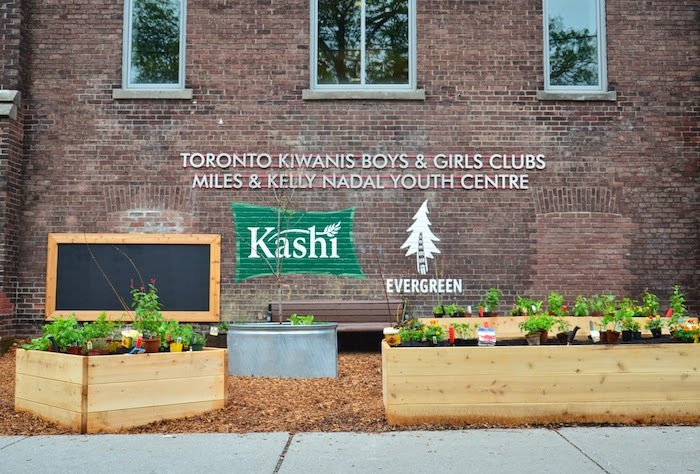 The above pictures are from the Kashi and Evergreen's initiative to build the brand new garden at the Toronto Kiwanis Boys and Girls Club. I am glad Kashi is building and supporting 18 community gardens, which will increase access to fresh, healthy, and locally grown food. I love this idea! I think it really benefits both communities but gives kids a good understanding of where their food comes from! Lovely idea.. prefect time pass for kids. I love this! I have herbs in a basin awaiting to be planted somewhere. But what I really want to plant this year is what you mentioned - violets and nasturtiums. So pretty to add to salads, drinks or just sparkling water. I absolutely love gardening. I think it should be taught in school, if more ppl new how to garden we would have less hungry ppl. It is so easy to have a garden even in an apartment. Thanks for the post . Thank you. This is a great initiative. What a fantastic idea. I hope everyone uses them. I love gardening...My 3 yr old has his own shovel etc. and loves to work right beside me! This is a great idea. We are trying to figure out how we can plant vegetables without all of the rabbits in the neighbourhood eating them!